The 11 host cities and their 12 venues for the 2018 World Cup are worth getting excited about. Russia is eager to impress and it’s making a monumental effort to do so. Fans at this epic event will be treated to some of the newest and most modern stadiums anywhere. Six of the 12 venues are being built specifically for the World Cup, with the remaining six being rebuilt or renovated to improve the fan experience. There’s no doubt these venues will be a highlight of the tournament. Then there are the host cities. These may be the 11 most distinctive cities that have ever hosted a World Cup together. From the European feel of beautiful St. Petersburg to the quintessential Russian capital of Moscow to the beaches of Samara and Sochi, each city will welcome visitors with its own unique experiences. Although its dramatic history goes back over 750 years, the city of Kaliningrad was largely destroyed during World War Two. It was promptly rebuilt and played an important part in the Cold War. As a result, the architecture is an interesting mix of old and new with the oldest building dating back to the 13th century. The city of almost 460,000 is rich in culture with a number of museums and theatres. Its appeal extends to nature lovers as well, as the region has plenty of pristine beaches and untouched forests. Its location just south of Lithuania on an inlet of the Baltic Sea results in a mild climate, with June and July conveniently being the best time to visit. Fans taking in a game in Kaliningrad will be treated to a brand new venue, Kaliningrad Stadium. The design of the new stadium is based on Allianz Arena in Munich, which hosted some World Cup games of its own in 2006. Currently under construction, the 35,000-seat, open-air stadium will have a focus on green technology and is scheduled for completion in late 2017. Kazan is a lively university city (population 1.3 million) with one of the highest standards of living in Russia, In fact, it could be considered one of the most widely appealing cities on the World Cup schedule in 2018. Tourism here is on the rise with plenty to see from historical buildings (Kazan recently celebrated its millennium) to live opera or ballet to trendy restaurants and boutiques. As one of Russia’s sports capitals, it’s a fantastic city to spend time in during the World Cup. Kazan Arena, completed in 2013, is a modern entertainment venue, complete with offices, corporate event space, a variety of food options, shopping and a fitness area; no wonder it’s also known as a ‘city in the city.’ The unique arena seats around 45,000 and is easily recognizable due to its massive HD screen adorning the front of the building. With twice as many people as its closest competitor (Saint Petersburg), Moscow is the largest city in Russia. It’s modern, yet steeped in history and this attractive combination is a big reason it sees more than 4 million tourists every year. 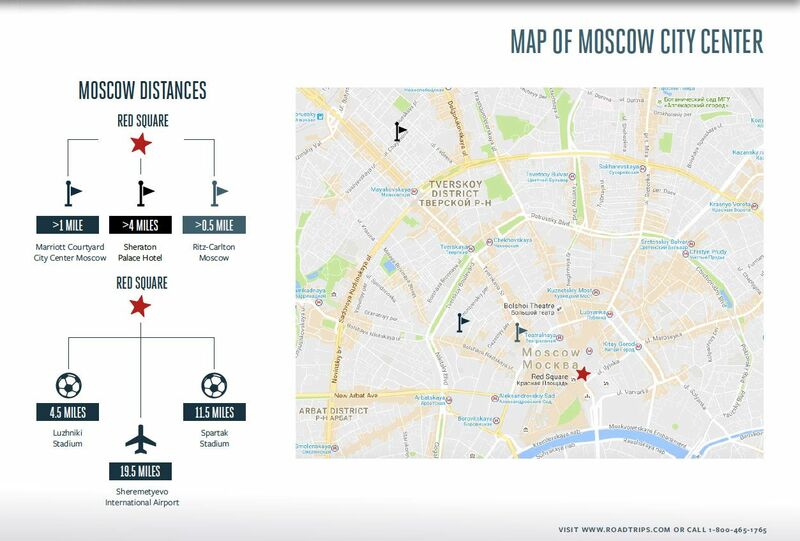 For most visitors, Red Square is the first stop in Moscow but there is so much more to see in this global city. While the mere mention of Moscow conjures up an image of ice and snow for many, the summers are warm but not too hot, perfect for sightseeing or taking in a match. Moscow is the only city at this World Cup with more than one venue. Spartak Stadium (also known as Otkritie Arena) is the newer of the two, having opened in 2014 with capacity for 45,000 spectators. Home to the Spartak Football Club, the stadium’s distinctive red and white exterior pays homage to the team. The iconic Luzhniki Stadium is both the oldest and largest stadium in the tournament and will host the opening match, a semifinal and the World Cup Final on July 15th. This 81,000-seat stadium has witnessed plenty of history in the making, including the 1980 Summer Games. With a growing population of 1.3 million, Nizhny Novgorod (or more commonly Nizhny) is Russia’s fifth-largest city and one of the country’s business, transportation, and cultural capitals. Beautiful Nizhny is located at the confluence of the Volga and the Oka Rivers. Though there are over 600 historic, architectural, and cultural monuments to explore, the highlight is the city’s Kremlin. This impressive 500-year-old fortress overlooking the Volga is surrounded by an equally impressive 2-kilometer wall. Like many of the 2018 World Cup Stadiums, Nizhny Novgorod Stadium is currently under construction and scheduled to open shortly before the tournament. Nizhny’s brand new stadium will boast one of the best locations in the city, overlooking the Alexander Nevsky Cathedral where the Volga and Oka Rivers meet. This modern city of over 1 million inhabitants could almost be described as eccentric. Where else can you find monuments to a water pipe or newspaper reader? Though Rostov-On-Don may have its idiosyncrasies, it really is a fun and unique place to visit; take a scenic stroll along the riverside; spend an afternoon shopping for anything and everything at the Central Rinok (Bazaar), or take in a performance at the Rostov State Opera and Ballet. Rostov Arena is currently under construction on the left bank of the River Don and is expected to be the start of development on that side of the river. This stadium, which is scheduled to be completed in late 2017 will be home to the Premier League’s Rostov Football Club. Second only to Moscow in size, Saint Petersburg is a picturesque port city on the Baltic Sea. Though it has long lived under the shadow of its larger counterpart, St. Petersburg has emerged as an appealing destination in its own right with a burgeoning arts and music scene. This modern city has 342 bridges atop its rivers and canals, not surprisingly earning it comparisons to Venice. The city is a feast for the senses, one of the highlights being the Hermitage Museum and the Winter Palace complex, which houses over 3 million pieces of art from around the globe. Future home to FC Zenit Saint Petersburg, Saint Petersburg Stadium opened in April 2017, nine years after construction began. The design of the stadium was decided by a competition, which was won by Kisho Kurokawa Architect & Associates for their ’spaceship’ submission. The arena has a retractable roof and holds close to 70,000 fans, one of the largest in the tournament. Most people don’t associate Russia with beaches but Samara’s lovely beaches may just be the city’s biggest attraction. During the warm summer months, locals and visitors alike gather on the sandy shores of the Volga to sunbathe, swim, or stroll along the beach. It’s a great atmosphere with plenty of cafés and beer tents to be found. If the beach isn’t your thing, this city of almost 1.2 million has plenty of other attractions to take in during your World Cup experience. Construction on the ambitious Samara Arena began in July 2015 with completion scheduled in the summer of 2017. Complete with a monorail that will shuttle fans to and from the matches, the stadium will be an architectural marvel. It is designed to resemble a gem, an 80-meter high dome of translucent glass panels. Samara Arena will seat approximately 45,000 people and will be home to the Premier League’s Krylia Sovetov Samara Football Club. With a population of just under 340,000, Saransk will be one of the smaller host cities at the 2018 World Cup. What it lacks in size, it makes up for in beauty. Located on the Saranka River, this European-influenced city has plenty of historical buildings, theaters, museums, and well-maintained parks. Saransk is also well-known for its sporting achievements, and is the hometown of many Olympic and World champions. Specially for the World Cup, the city of Saransk is building an arena much bigger than they would otherwise need. Seating capacity for the World Cup will be in the 45,000 range, though the upper level seating will later be dismantled, resulting in a permanent seating capacity of approximately 28,000. The empty space will be filled with shops and leisure space. Located on the banks of the River Insar, Mordovia Arena’s design is built to resemble a solar sphere and is will make an exciting new addition to the city’s central core. Sports fans will fondly remember Sochi as the successful host of the 2014 Winter Games. It’s Russia’s largest resort city, flanked by the majestic Caucasus Mountains and the Black Sea. As the southernmost city at the 2018 World Cup, it has a mild climate that attracts hundreds of thousands of tourists every year. It’s a great place to try your hand at some adventure sports like mountain climbing or hang-gliding but also an idyllic spot to relax and lounge by the pool. Home to the Opening and Closing Ceremonies at the 2014 Winter Games, the 48,000 seat Fisht Stadium will host 4 group stage matches, as well as a round of 16 match and a quarter-final match. The roof of the stadium, which was designed to look like snowy peaks for the Winter Games, has been partially removed to open it up for the World Cup tournament. Formerly known as Stalingrad, the city is perhaps best known for the infamous battle that took place there during the second World War. Since then, the city was completely rebuilt and renamed. Present-day Volgograd has plenty to see and do. A visit to the Mamayev Kurgan memorial complex is a must-do, but the city is also well-known for its eco-tourism (due to its proximity to the Volga-Akhtubin floodplains) and its magnificent Soviet Baroque architecture. Volgograd Arena is currently under construction on the site of its old stadium, which was recently demolished to make room. During the preparation phase, a thorough inspection of the building site had to be conducted after a number of unexploded WWII bombs were found in the vicinity. This modern-looking stadium will have capacity for 45,000 fans and a unique roof which will be held in place with steel cables, similar to the method used in suspension bridges. With a population of 1.3 million, Ekaterinburg is Russia’s fourth largest city but it tops the list when it comes to unusual attractions. Among them are the mafia cemetery (complete with graves decorated with life-size images of late mafia members), and the circus building which is home to exactly the kinds of shows one would expect upon hearing the name. The strangest attraction however, is the QWERTY Monument, a giant keyboard replica built out of concrete blocks. When Ekaterinburg Arena (aka Central Stadium) first opened in 1957, its seating capacity of 27,000 made it one of the largest in the world. While no one would describe the stadium as such in the present day, the stadium remains impressive nonetheless, and is one of only a few existing stadiums that will host World Cup matches in 2018. It is currently undergoing an extensive renovation (scheduled to be completed in late 2017) in preparation for the iconic tournament. The improvements include the addition of over 8,000 seats, 2 new metro lines, a press center, as well as improvements to the food vendors and security system.